Demand for Tesla Model 3 sedans is driving sales of electric vehicles to new heights in Norway. Here, a Tesla delivery site is seen in Lillestro, Norway. 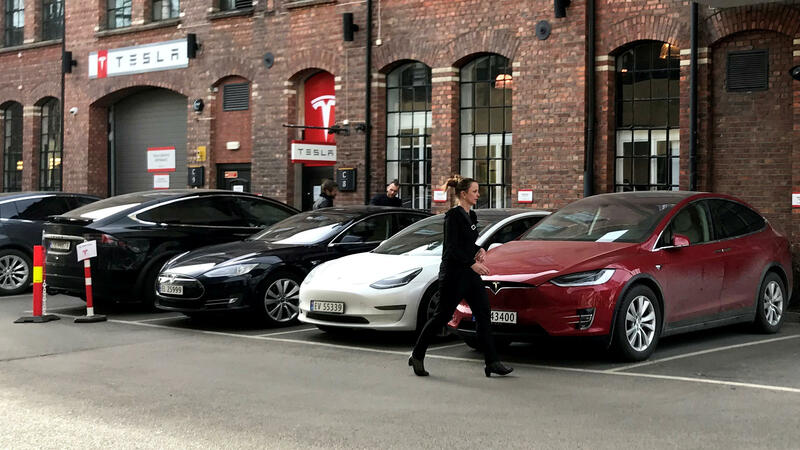 Electric vehicles are now the norm in Norway when it comes to new car sales, accounting for 58% of all car sales in March. Tesla's mass market Model 3 was especially popular, accounting for nearly 30% of new passenger vehicle sales, the Norwegian Information Council for Road Traffic, or OFV, says. Overall, 18,375 new passenger cars were registered in Norway last month, the OFV says. Of those vehicles, 10,732 were rated with zero emissions — a gain of around 100% from the previous March. And nearly all of those vehicles are electric (four are hydrogen-powered).